Do you love bass fishing? Are you in search for BIG BASS or Trophy largemouth bass? Florida is the destination for you if you are looking for the fish of a lifetime. Many destinations around Florida can provide you with a trip of a lifetime. Our local experts are dialed in and ready to put you on the biggest bass of your life. 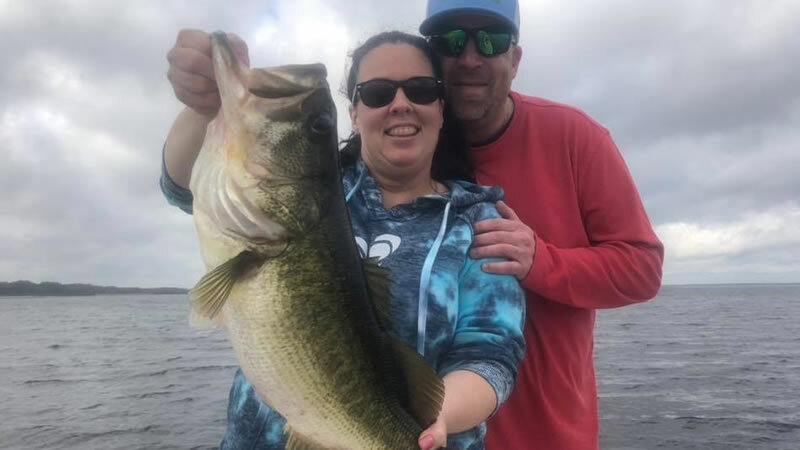 Every week and day, we are seeing exceptional catches on our Florida Big Bass Fishing Charters! Florida is an interesting place to explore and visit. The “winter” months happen to be the best time to come fishing. One of the many reasons is the largemouth bass spawn. Unfortunately, weather plays a crucial role in the timing of this spawn. Even though Florida is historically warm, we do experience cold fronts. Cooler weather rolls through and can play an integral role in the bass fishing. Most of the time, it gets the water temperatures right where they need to be to kick start the spawn. Other times, it can plummet the temperatures, making fishing conditions tougher. No need to worry about these cold fronts though because it’s Florida, weather changing rapidly. One day it can be cooler and the next day it can be sunny, bright and warm. When the weather brings cooler temperatures, it causes the water temperatures to stay cooler for a longer period of time. As a result, you have late spawns. Typically, December through March is the prime times to catch bass during the spawn. Now, the spawn has continued through the month of April. March and April are prime times to come catch a trophy largemouth bass. Many get nervous about catching bass that are mating or guarding a bed. 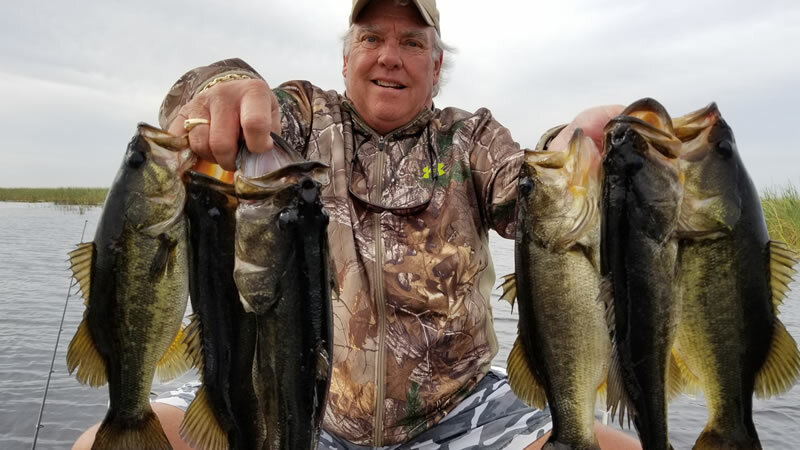 When you come fishing with our local experts, they know exactly how to handle and take care of breeding largemouth bass. We love to capture the big fish and set her free. Once you place her back in the water, she goes right back to her bedding spot with no harm. Catch and Release is always the preferred method when fishing for bass. When it comes to catching a big bass here in Florida, live bait is the way to do it. There is no better way to do lure in the biggest bass of your life than to use natural forage. All our bait is wild caught and very lively. Artificial lures can produce success as well. All our captains and local experts come equipped to provide you experience in both. experts can get you on largemouth. Our local experts can get you around the bass and are all highly knowledgeable of Rodman Reservoir Fishing. The largemouth bass currently are in all three phases. You have plenty of bass in pre-spawn, spawn, and post-spawn phases. This makes fishing very exciting and worth experiencing. February and March are the best times to capitalize on the spawn. April’s moon phase will also be a great time to catch some big fish. The last of the spawners are currently working on making beds. One of the many reasons that North Florida has exceptional bass fishing is consistent cooler temperatures. The bass have the ability to grow larger as their metabolism is not as fast. Now is the time to come experience the Rodman Reservoir and our local experts are looking forward to showing you around! 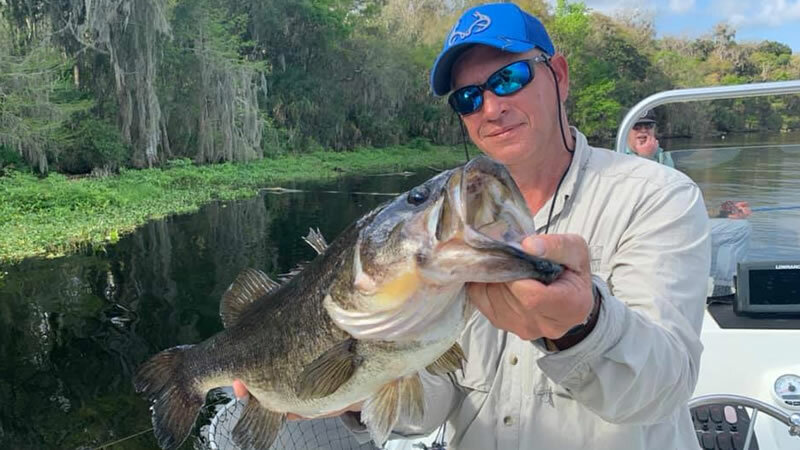 Next, on the Florida Big Bass Fishing list is Lake Tohopekaliga or Lake Toho for short. Lake Toho is a large lake in Central Florida in the city of Kissimmee. Many travelers come to this beautiful destination with their families to visit Disney World and the many theme parks. What they don’t know is that there is a world-class largemouth bass fishery right around the corner. As of current, March has been a fantastic month for catching big bass. 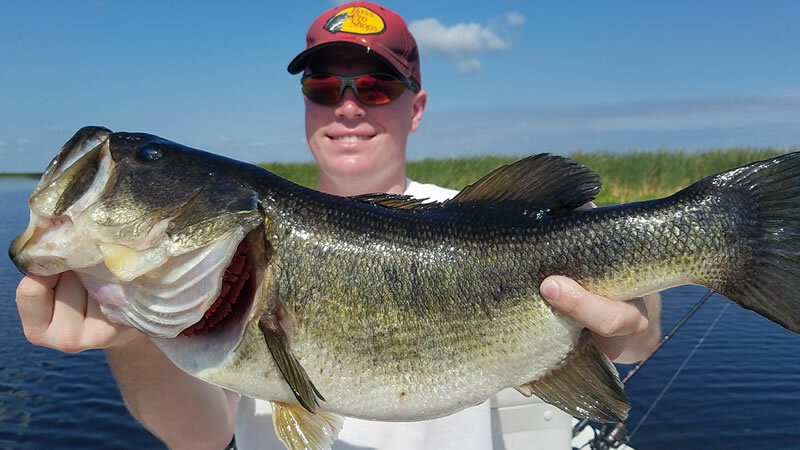 Big females are still being caught on Lake Toho. Our experts are saying that now until the end of April will be a great time to come catch big bass on the lake. 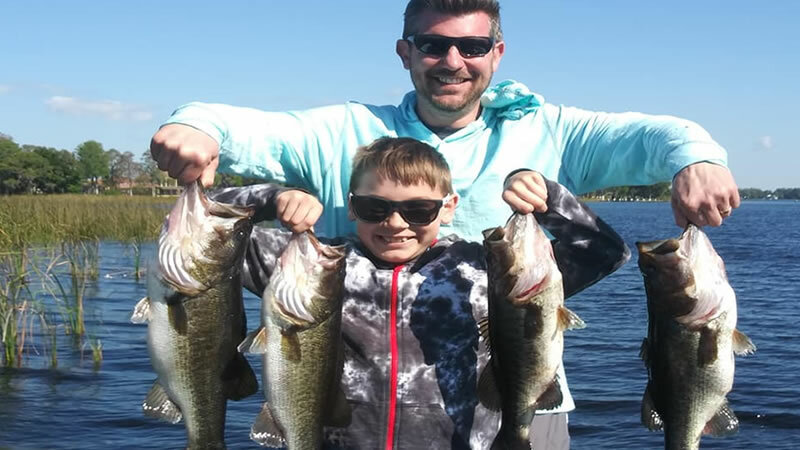 If you are looking for an outdoor activity perfect for the family, you have to try Lake Toho Bass Fishing. Our local experts would love to provide this once-in-a-lifetime experience. Traveling further west along the west coast of Florida, you come across another Florida Big Bass Fishing paradise. If you are looking for clear water lake that holds some excellent fishing all year round, Lake Tarpon is your fishery. Lake Tarpon is located near Tampa, FL and is a fantastic fishery to explore. summer offshore pattern kicks in. Our local experts will guide and educate you on catching trophy bass here all year long! Have you ever heard of the famous, world-renown Lake Okeechobee? It is the last stop you should make when searching down Florida Big Bass Fishing. It is home to some of the BEST bass fishing in the state of Florida. 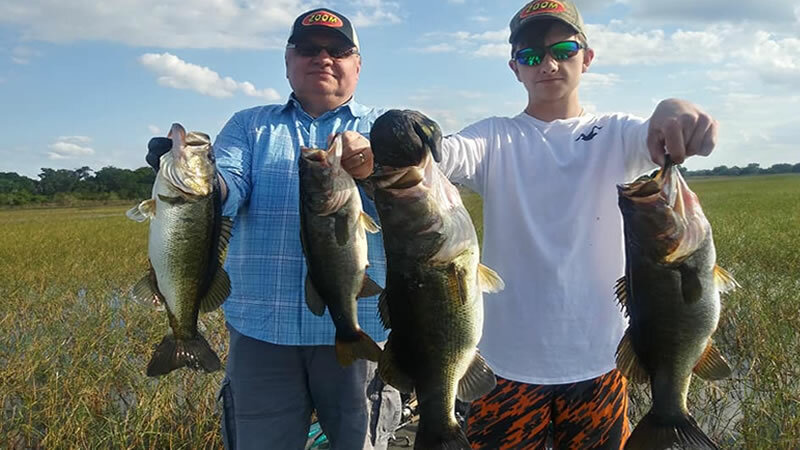 The spawn is not over on Lake Okeechobee and the best fishing is always saved for last. April’s moon phase will draw in the final wave of spawning fish providing you access to some big fish. We have seen several trophy-sized bass caught this month and know there are more to come. Lake Okeechobee is alive and well and you should not listen to the press. They are not local experts that are on the lake every day. This beautiful fishery is your gateway to landing some big bass while visiting Florida. We hope to provide you the opportunity to experience all that there is to offer. Florida Big Bass Fishing is a great way to get a loved one addicted to fishing. Our local experts guide you and educate you on all the right ways to fish for largemouth bass. Yes, they are experts and professionals that work here in Florida but the techniques you learn can be taken to other destinations across the United States. Learn a technique and apply it to your lake back home and watch the success you have. We truly look forward to helping you experience something magical right here in sunny Florida. Hop on board for a fishing adventure of a lifetime and we will see you on the water next time! Your Adventure Starts Today while Visiting Florida. If you enjoyed this post about Florida Fishing, you might also enjoy our Fishing Blogs.